First off: technical terms. It might make it easier if you think of poems in terms of songs. Well-written song lyrics really are poetry if you think about it. They have melodies, they have time signatures, they have rhythms, etc. The same thing can be said of poetry. Couplet: a two-line stanza that often rhymes (typically using end rhymes) but doesn't have to. Sonnet: a 14-line stanza that can be a single poem, or you can have a larger poem that has a bunch of sonnets as its stanzas, so you can get a little creative. Iambs: one unstressed syllable followed by one stressed syllable; this is really common in English poetry. It goes da-DA. Trochee: the reverse of an iamb, a stressed syllable followed by an unstressed syllable, so DA-da. Anapest: two unstressed syllables followed by a stressed syllable, so you've got da-da-DA. Those are the kinds of feet that you can have. The pattern of poetic stresses is called meter, and, much like in music, the sound patterns that result can be referred to as rhythm. You've probably heard someone refer to a song or a novel or a phrase as poetic. But what are the exact qualities of poetry that distinguish it from normal, everyday writing? The term we use for the everyday writing that you find in letters and novels is prose. When you think about it, meaning in prose comes from the actual definition of the words being used. In contrast, in poetry, additional meaning is found by looking at the layout and formal qualities of the words, such as their sound. In English, all words can be broken up into a word's basic sound, called syllables. The word is, for example has one syllable, while the word to-day has two syllables. The word to-mor-row has three syllables, and the word un-for-got-ten has four syllables. When speaking in English, we emphasize some syllables in words more than others. To see this, think of the difference between the words pro-duce and pro-duce. Although both words are spelled the same, when we emphasize the first syllable we mean fruit and vegetables, as in pro-duce at the market, and when we emphasize the second we mean creating, as in cars pro-duce pollution. English poetry is often organized around this emphasis to create patterns of sound. More specifically, meter is the term we use to describe organizing poetry around how words are emphasized to produce a rhythm. Meter is broken down into specific patterns of emphasis that are made up of two or three syllables called feet. An iamb is made up of two syllables, in which the second is more pronounced than the first. Some examples are be-tray and col-lide. A trochee has two syllables and is the reverse of an iamb; that is, the first syllable is emphasized and the second isn't. Examples are: pep-per and strong-er. A dactyl has three syllables: the first is emphasized and the second two are not. Examples are: buf-fa-lo and scor-pi-on. Finally, an anapest has three syllables: the first two are not emphasized but the last is. Examples are: in-ter-vene and o-ver-come. So, now all we have to do is put the name of the foot used with the number of feet used in each line to describe meter. When a poem has six iambs, for example, we call it iambic hexameter. Or, when we have a line with four spondees in it, we would call that a spondaic tetrameter. 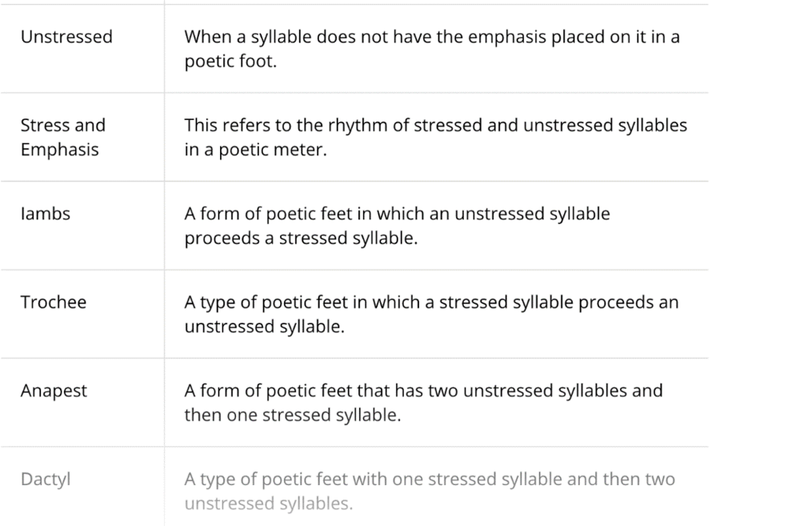 There's a lot of terms here, and the important thing to remember is that the meter of a poem is named simply by noting the foot and the number of feet in each line. If you listen closely to rhymes in poems, you'll find that there are actually quite a few ways to arrange them. These specific arrangements of rhymes are called rhyme schemes. Read the poem several times to get accustomed to the poet’s style. Read the poem slowly. Notice where sentences begin and end. Apply what you already understand about part of the poem to the parts that seem more difficult. Listen to the sound and the rhythm of the words. Pay attention to the title for clues about the topic and the theme. Identify the speaker of the poem. Grasp the literal meaning of the poem. Infer the suggested meaning if there is one. Poetic language often appeals to the senses. Poets use literal and figurative language. Literal descriptions can help you visualize the physical appearance of a person, place, or thing. The central purpose of purely descriptive poetry is to help you “see” a detailed image. A simile is a comparison using the word like or as. A metaphor is an implied comparison in which the writer states that something is something else. Personification is a figure of speech that represents non-living things as humans or animals.